How does the vertical structure of low cloud produced by global models compare to observations? Climate models diverge in their prediction of climate sensitivity. This spread is caused by the uncertainty in predicted changes in the shortwave cloud radiative effect, in particular in regimes with trade-wind clouds. In a number of papers we have investigated how numerical weather prediction and climate models represent the vertical structure of clouds in the trades in our current climate (see Figure below), as well as how modeled cloudiness co-varies with the structure of humidity, temperature and the winds in the lower troposphere. The modeled behavior is evaluated against long-term ground-based observations of cloudiness and the trade-wind layer structure at an observatory on the Island of Barbados. These show that models tend to overestimate variance in the major contributor to cloudiness in the trades, which comes from small cloud sitting near the lifting condensation level. At the same time, they fail to represent variations in the depth of cumuli, and the changes in temperature inversions and winds that accompany these variations. The observed behavior in cloudiness suggests that convection itself is a strong regulator of cloudiness, leading to relatively small correlations between cloudiness and the large-scale state, in particular on time scales less than a month. Below figure: the observed and the modeled vertical structure of cloud fraction, relative humidity and potential temperature in the lower atmosphere as measured with remote sensing instruments at the Barbados Cloud Observatory (BCO, in black). The two profiles correspond to boreal Winter (Jan-Mar) and Summer (Sep-Nov). Five approximate layers are distinquished: the mixed-layer (ML), the transition layer (TL), the cloud layer (CL), the inversion layer (IL) and the free troposphere (FT). Also shown is a histogram of the pressure levels at which the strongest inversions are found. 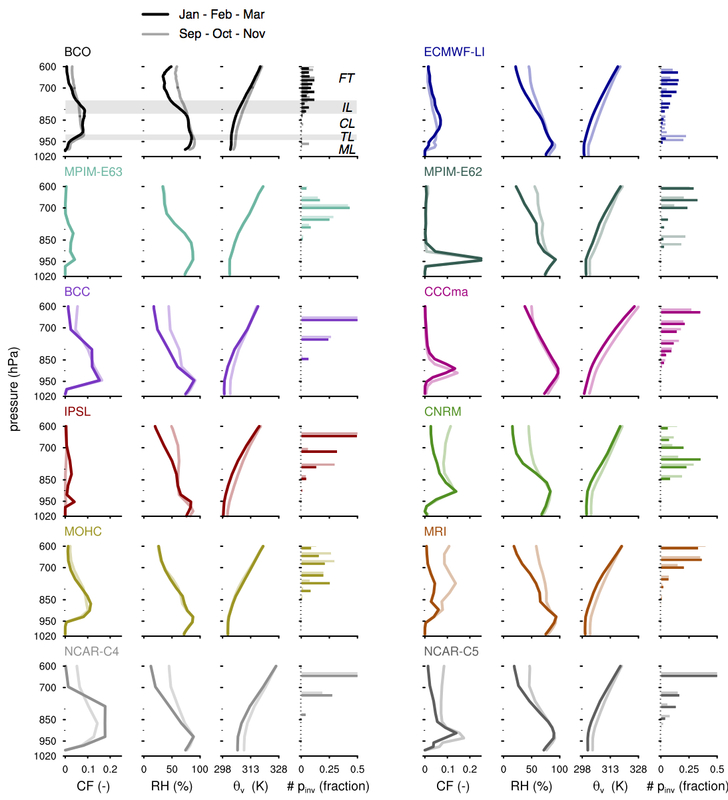 The other panels show the same profiles but for a numerical weather prediction model (the ECMWF IFS) and a number of climate models from different institutions. The model output is single-timestep output from one model gridbox near Barbados. Nuijens, L., B. Medeiros, I. Sandu and M. Ahlgrimm (2015). Observed and modeled patterns of covariability between low-level cloudiness and the structure of the trade wind layer ,Journal of Advances in Modeling Earth Systems, 7, DOI: 10.1002/2015MS000483. Nuijens, L., B. Medeiros, I. Sandu and M. Ahlgrimm (2015). The behavior of trade-wind cloudiness in observations and models: the major cloud components and their variability , Journal of Advances in Modeling Earth Systems, 7, pp 600-616 DOI:10.1002/2014MS000390.